In August of 2001, Francisco Toledo arrived in Los Angeles with the intention of painting for one year. Despite the turmoil of the post September 11th world, including heightened racism within the United States, Toledo stayed in Los Angeles and created a body of work which forms the basis of the current exhibition. Famously reluctant to exhibit, “FRANCISCO TOLEDO Recent Paintings” presents a rare opportunity to view new work from one of Latin America’s most acclaimed artists. Among the new paintings to be shown at Latin American Masters is the dramatic, Bat Ikat. 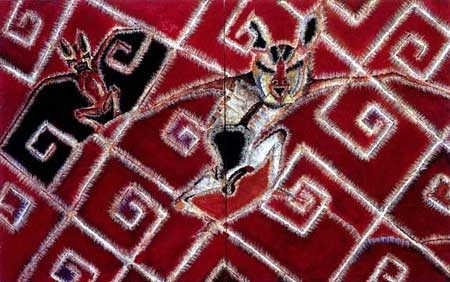 This work shows a bat in mid-air, flying through a brilliant red ground, which suggests both the intricate patterns of traditional Asian textiles and the flames of a raging fire. Painted in the months after 9/11, Bat Ikat evokes a vision of catastrophe, at once contemporary and primordial. In a remarkable group of five recent works, Toledo brushes oil and encaustic onto wood panels treated with gesso. He then carves into the painting’s surface, “releasing” the luminous under-layer. The resulting incised lines, at once delicate and aggressive, suggest both a wounding and a suturing together of the painted surface. Some of these, such as Murcielago Enojado, and Peces y Camarones, are among the finest achievements of the artist’s career. Toledo continually challenges himself to find new means of expression. In this exhibition, the artist rejects the use of sand, a favored textural device, and creates surfaces minimally painted with thin, delicate washes of pigment. The resulting paintings have a subtle, watercolor-like transparency. Tortuga Poniendo and Cangrejo Viejo exemplify this understated approach. Francisco Toledo has exhibited worldwide, including: Schirn Kunsthalle, Frankfurt; Centre Georges Pompidou, Paris; The Art Institute of Chicago, and The Museum of Modern Art, New York. In 2000, Toledo retrospectives were organized by the Whitechapel Art Gallery, London, and the Museo Nacional Centro de Arte Reina Sofia, Madrid.